Jumpstart Corps members have the unique opportunity to inspire young children to learn, serve in a local community, work on a team, and build professional skills. 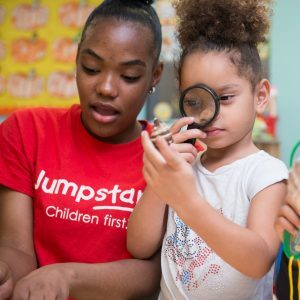 All Corps members receive high quality training to help them implement Jumpstart’s outcome-based program, promote children’s school success, and build family involvement. Able to verbally communicate with peers, Jumpstart staff, children, children’s families, and classroom teachers. Able to arrange his/ her own transportation to service site in a timely and reliable fashion. Able to participate fully in the classroom during Jumpstart’s intentional activity time. Working in the classroom includes a variety of activities such as Reading, conducting small and large group activities, and enhancing indoor and outdoor times. Jumpstart members will rotate between 2-3 classrooms providing intentional activities for at least 90 minutes, three times per week in each classroom, spending approximately 4.5 hours per week in each classroom. Able to participate fully in 30+ hours* of pre-service and 10+ hours* of on-going in-service trainings. Trainings are delivered in a variety of formats (such as lectures, PowerPoint presentations, web-based trainings, small group discussions, and role-plays), with other Corps members in a training room. Able to participate fully in 1+ hour* team planning meetings and session preparation 2-5 times per week,* which includes planning, reflection, and/or training, for a total of 2-5 hours* per week, working with other Corps members in a small group to reflect on and plan for weekly sessions. Able to complete 1-5 hours weekly* of individual planning and preparation for Jumpstart sessions. This includes preparing children’s books, writing reflection papers on Jumpstart service, and gathering materials for session activities. *Hours and service requirements vary from site to site.